One way to better understand Jesus' word is to compare a man commuting to work by air free of traffic with a man driving to work in down town by car fighting heavy traffic. For over a decade I used to work in down town LA. To report to work before 9:00 a.m., I had to leave home in Long Beach around 7:30 a.m. The route was to go Lakewood blvd. north, hit 405 n. then 110 n. and then get off at 6th street. 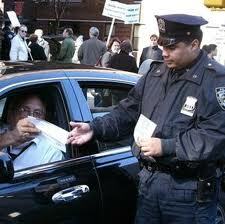 And I had to fight the traffic, worrying about the possibility to get moving violation tickets. So I thought how good would it be to own a flying machine (like helicopter or a flying wing set) to travel by air, for if I did I would get into a flying machine, take off the ground, fly up into the air, and cruise above the ground without worrying about cops giving me tickets. I can enjoy the scene of people esp. cops fighting the traffic down below! Travel by air or car takes place in a physical dimension. But life here on earth in a physical body takes place first on a spiritual dimension which is reflected in and dictates the conditions of the life that is manifested in the physical dimension. So compare: 1) cops to Satan, also known as the Devil or the ruler of the air (this world); 2) a man traveling by means of ground transportation like car to a man living as a man born from below; and 3) a man traveling by air like a flying machine (that is Jesus Christ) to a man born from above. Who get the tickets, who don't? Who categorically remain condemned to keep committing sins (and therefore constantly are in need of getting 'disciplined', having to endure hardships all the time) and who don't? The answer is obvious. 8) sprinkled blood that speaks a better word than the blood of Abel. 3) The holy city (the new Jerusalem) (21:2,10; 22:19). So remember: "you have come" [not you will]. So there is the life to live here and now that is the life from above not from below. Today is Oct. 29, 2012. Around noon a friend of mine, Shannon Lee, visited my house. We had a talking fellowship, sharing thanks topics and prayer topics. In so doing, Shannon asked me a question: "How can you prove that God exists?" Without waiting for my answer, he answered the question saying, "Missionary Isaac, last week we celebrated ten year wedding anniversary. If some doubt that God exists, just look at us because for us remaining married for ten years is a living proof that God exists." Then he said, "I learned core values from UBF." "What do you mean by the core values?" I asked. Three weeks ago we had a staff conference in the east coast. In order to attend the conference I had to fly out of LAX to Baltimore. There I had to rent a car. For the journey then I made it sure that I carry all the items necessary for the travel like wallet (with driver tugged in), Iphone, Ipad, etc. 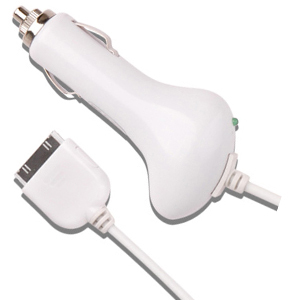 But I missed one item: Iphone car charger! I arrived at the Baltimore at 10:30 p.m. (you know you lose three hours moving from the west coast to the east coast), rented a car, punched the address in the box (destination) on the GPS system (Waze on Iphone), and started driving. But alas! The battery is dying up. And it was raining outside. And I was stuck. First, my journey here on earth in a physical body to His kingdom requires a lot more preparations than traveling from the west coast to the east coast. 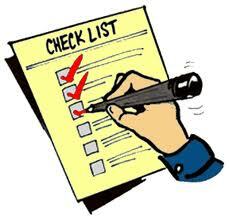 Second, prepare a checklist for the journey and check all the boxes before embarking on the journey each and every day. Question: what are you to check? What ought to be on the checklist? No. 7 - see the Day approaching (25). In 1 Samuel 1:24, Hannah brought to the Lord three offerings: 3 year old bull (or three young bulls in Masoretic Text), an ephah of flour (enough to make pancake for one man to eat months if not a year), and a skin of wine. On his own no human beings, no matter how clean, can come to God for his use. The morning program came with a special message on the Importance of Prayer and the Holy Spirit that unite people through the World Mission, by Pastor Insoo Chung. Holy Spirit ought to come upon, dwell-in, and walk with his servants. Three sources of power people consider rely upon - Holy Spirit, your character, and money. 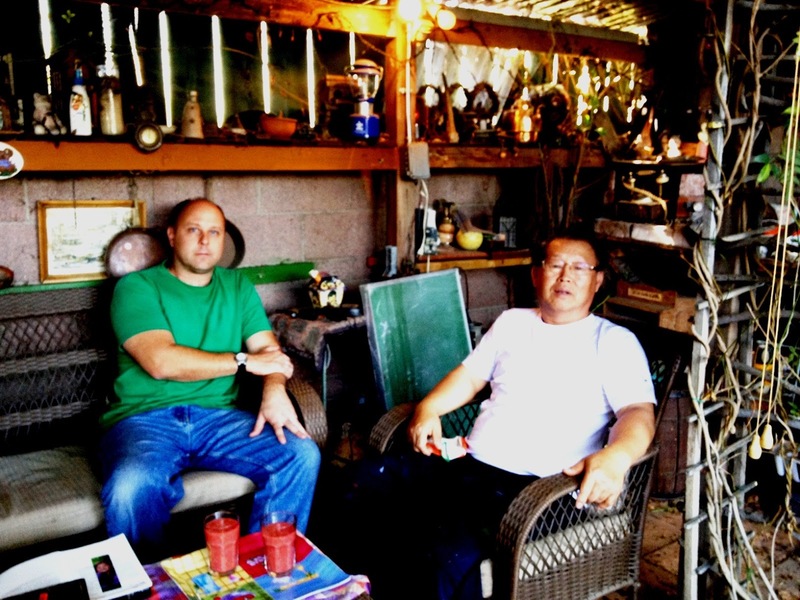 He is 1.5 gen pastor, and traveled 49 countries. He witnessed God's work in mission fields is done not through man's power, money power, but the power of the Holy Spirit who ought to come upon, dwell in, and walk with His servants. Second, Pastor Sungkwan Yoo (a member of the Board of Director of SIM) talked about the mobilization of man-power for world mission. He presented a video clip entitled Discipleship Training and World Mission, focusing on the late Pastor Hanoum Ok, the founder of the Love (sarang) Church, who came up with discipleship programs. They have 2000 cell groups, where they established 650 disciples (cell leaders). Pastor Ok established Pastor Jung-hyun Oh as his successor (recognizing Pastor Oh's successful ministry in LA). His philosophy on the ministry is to love one soul by raising him or her as Jesus' disciple. Go (king)--> Make disciples (prophet) --> baptize (priest)--> teach (missionary)--> obey focusing on the area belonging to the 10/40 windows belt in which Korea is the beginning point; this territory is in need of bread and gospel. The key is lay man movement. He attended the UBF World Mission Conference in Europe and received much grace from the examples of UBF missionaries making disciples. We need to mobilize 7.3 million Korean Diasporas in 180 nations, riding on what God does such as Korean pop culture spreading vis news media like Video Clips like Gangnam Style by Psy. There is the change on the environments of the world mission, that is, globalization, urbanization, and specialization with everything going digital. Note drastic reduction of Unreached People. Consider onslaught of Islamic Influence. Multi-cultural trend. Holistic Mission is needed. Gateway City Mission is necessary. Multi-directional trend (meaning gospel spreads not one direction like east west or north south etc. but multi-directionally). Spiritual power, economic power, man power are three key factors for a spiritual power nation. In Sarang Church every year 1,200 people come to receive discipleship training. Make all (nations) as disciples. Who should go? You. Where? Begin where you stand. When? Now. Pastor Sang-cheol Song responded saying what we need is healing, discipleship training, and missionary training. Once at a monastery monk candidates were going through a training program. One monk was problematic. He once was asked to preach a sermon. He took the podium and said, "Who knows what I am going to preach today?" All said, "We don't know." Then the man said, "when you don't know what I am going to preach, you don't deserve to hear what I am going to say. All of you are dismissed." Next Sunday they gave him another opportunity to speak. Then he asked the audience the same question. People all raised hands saying, "We know what you are going to preach." Then the man said, "Since you already know, I do not need to speak. Go and do what you know." Next Sunday he was given another chance to speak. The man took the podium and asked the same question. About half raised hands saying, "We know", but the rest said, "We don't know." The man said, "Those who know teach those who do not know." 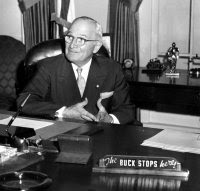 Then he stepped down. The chief of the monastery was deeply impressed, so he hung out at the front of the monastery a sign, "from those who know to those who do not know." Korean church has many problems like: Extreme dualism; return to Roman Catholicism (clergy vs. laity) [pastor is exercising too much authority]; mega-size going business-mindedness, adopting commercialism, absorbing small churches; fragmentalization, so those who are with money and power do not listen to others such as denominational leadership; shamanistic trend; demoralization of pastors; secularization. The solution is discipleship training which comes from training and the work of the Holy Spirit. The key is to produce not just tech person but godly man. - It is our duty to help them. - They are our own flesh. - God's time has arrived. - We need a mediator of peace. - We need to practice love as fellow human beings. - Serving is the duty of the strong. - We are debtors of gospel. - Many defected from N. Korea. Jesus is the first ambassador sent by God. How did he do? He did it as seen in John 17. He only served what he heard from the Father. He did not mix his ideas. We need to follow the same thing. We should not be like Samuel Muffet who wanted to know first and then believe. Faith means believe and then know. He spoke of the great men and women of 'faith' such as Kwon-nung Choi, Ki-chul Choo, Yang Won Sohn, Sarah Barry, etc. Memorize John 17:18. As Daniel 5:25 says, weigh what you say or do on God's scale, for your words or own doings coming from your ideas amount to nothing: only do as God says in the Scriptures. .
Billy Graham Library was located about 10 minutes away from the Charlotte church. Dr. Billy Graham is now 93 years old, and is going to be 94 as of Nov. 7. He is writing a book which is about to be published. His wife Ruth died in 1994 two weeks before the opening of the Billy Graham Library. SIM HQ (Sudan Interior Mission) (which now changed Serving In Mission) is also located about 10 minutes from the Billy Graham Library. It was founded in 1893 to support the Sudan Inner Area Mission, founded by three young men. Thus far they sent out 1,600 missionaries to 50 different countries particularly Africa and Asia. Their purpose is to operate as a bridge between church and mission fields, so as they accept missionary candidates from church organizations they train them, equip them, send them, and follow up on them. And their mission includes recruiting empowering them and caring for them until they retire. The facilities include administrative buildings, residences for trainees and staff members sitting on about 90 acres. About 100 staff members work at SIM HQ. Admin functions include financial, fund raising, media relations, maintaining websites, literature, etc. Fund raising for general operation and special projects come through one on one presentations and contacts based on mail list. Training program also includes 2 week start up program (get to know session), cross-cultural studies, language acquisition, etc. Each year 60-80 missionaries are being sent out. After lunch there was a photo session. Afternoon hours came with network workshop and group workshop on mentoring. Network workshop consisted of 11 sections. Reaching out to the UUPG. Mentoring workship included 11 departments, corresponding with the network workshop sections, and mentors who served included Wonsang Lee, Sunki Ho, Kihong Han, Hyunsoo Lim, Insoo Chung, Kyungsik Kim, Sangchul Song, Abraham Kim, Sukwhan Oh, Sunkwan Yoo, Hyetaek Kim, Myungho Yoon, and Sunkyu Whang. After dinner, Dr. Peter Chang presented a presentation on God's work in Europe (UBF). The message was based on Nehemiah 2:17, and came with power points. He shared two things: how through faith The Lord blessed the one to one Bible studies with shepherd's heart for German University Students; second, the importance of working with other church organization leaders. In Africa they pray and praise The Lord. But why there is no change? What is the missionary work? Genesis 1:26-28 teach us what the missionary work is all about. Africans do not know how much God blessed them. They are bright. They do not know how to use God's gifts. Their view of world is wrong. Tanzania has the HQ of Muslim. They study Quran three hours a day. They are building UAUT (United African University of Tanzania) in order to change the life-script of the Tanzanians. He is from "hapdong" side. He got things organized per areas and denominations. He also established Tanzania Korean church, Calvin Divinity School, and Tanzania Presbyterian Foundation. He also established Jesus Village. Muslims do not come to church, so he established a medical clinic. Then they kept coming. He secured 300 acres for UAUT. When he presented God's vision they started working, though they were 90% Muslims. Vision education ought to start from ground up - kindergarten. UAUT's oriented objectives: the world class university; the united university; the best quality university; the globally diverse universe university. Student centered education. 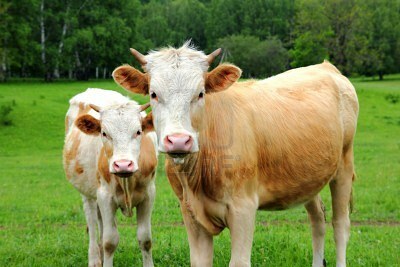 Future image of techno valley. Change Africa to God's kingdom. Late Evening Sermon entitled, "The church filled with the vision for the world mission" by Pastor Hyetaek Kim of New York Choongsin Church. Psalm 109:17; read also Heb 7:7 and Num 6:27. First, What is mission? It is the Father's wish, that is, salvation of all nations 24,000 tribes on the planet earth. It is Jesus' command. We can overcome poverty via the hope of God's kingdom. Without Jesus we have nothing; with Jesus we have all. Jesus also promised to be with those who put trust in Him. It is the purpose of the Holy Spirit. First, help local churches to lead. Second, all laypersons ought to be trained as missionaries (this means you need to establish a mission school where each year they need to be trained for 3-4 months. 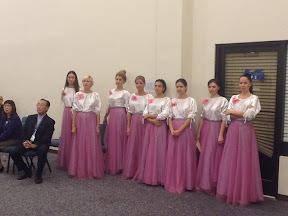 In this way in Kazakstan almost all local tribes and villages were evangelized. All churches are now self supporting. Now the doors are closed. Only a church with more than 50 members can register with the government. Third, church-wide world mission movement. Lately he trained 70 members with the full gospel, went to Haiti. They got themselves divided in groups, and started sharing the gospel. In seven days the whole village was changed with the gospel. On one occasion he also took members to a Muslim village with a little over 3,000 people. One of the members knocked on the door. Prayed for a man suffering from epilepsy. The patient got healed, and the whole village came to Jesus. Fourth, the church focused on the people who did not hear the gospel. Matthew 24:14; Rev 7:9-10. Unreached people stand for the people where only 2% or less are believing. Since 1974 there were 12,000 unengaged tribes, of which 6,000 are now evangelized. There are 3.9 million churches. Now about 3,000 tribes are UUPG (where there is no missionary, no scripture, no church, no known believers). It was a small Antioch church that impacted the world salvation work. Matthew 16:18 - Jesus will himself build His church. Special glass plate of recognition was awarded to 18 missionaries including Peter Chang, Stephanus Park, Hanna Ryu from Germany, Juan Sur of Venezuela, and James Lee from S. Africa. Then they cut the 10 anniversary cake. And close the meeting with a benediction. From 10:30 a.m. a session followed on the title, "World Mission and Leadership". Pastor Hee Min Park of Eternal Pleasure Church in LA led the session. Primarily he said where there is one person who sacrifices what he has for the Lord, the Lord blesses him and uses him as a source of blessing. Give to the Lord something, then the Lord will give you back ten times more. One church pastor was working on a construction project for a church building. The cost was estimated to be $20 million. The members pledged only one third of the estimate. One old lady named Man-soon Ahn had a life time wish to save $10k in cash. But she had no way of saving that much of money. But one day she came to the church and heard a pastor preaching, "If you want to get anything, do not just sit with a wishful thought, but start acting with a small thing." Then she started saving money beginning $1. Finally she saved $10,000. That day she was so glad that she withdrew the money from the bank, put all the cash in her bag, and went to a market to buy a set of nice Korean traditional costume. She wore such rags that the store owner despised her. But she opened the bag and flashed the cash money. The store owner changed the attitude and greeted her into the store urging her to buy best sets even at a discounted price. But the lady did not buy. She went to a shoes store. She did eye shopping. She flashed money and the store owner made good offers, but still she did not buy any shoes. Then she visited a jewelry and flashed the money. The store owner loved her and wanted to sell rings and necklaces. But she did not buy a thing. On the way back home, she felt the urge to visit her church. While seated at the church sanctuary she heard a voice from heaven to offer the money to God for the construction project. So she visited the pastor. At the pastor's office, she shared with the pastor how she saved the money and now she wanted to donate the money to God for the construction project. The pastor heard the story, and could not possibly accept the offering. He gave the money back to her, but she gave the money back to him. The envelop holding the money went back and forth. Then the lady and the pastor all wept together. Finally the pastor heard a gentle whisper from The Lord saying, "Why are the two of you making so much fuss out of the money which is all mine? It is 'my' money." Then the pastor repented and accepted the offering. The next Sunday the pastor shared the story about the lady's sacrificial offering in his sermon. Then the whole church congregation heard the beautiful story. From one corner, a woman stood up and asked the pastor, "Pastor, I would like to donate a Korean traditional set of clothes for the lady." Then there was a roar. Another person stood up and asked the pastor, 'Pastor, please accept my offer to donate for her a pair of shoes she wants." Another roar. Then another person stood up and said, "Pastor, please accept my offer to provide for the lady six months of living expenses." Whole church clapped. Moved by the lady's sacrificial donation, the church members started making new pledges, so within the next week the pledge amount went up from $7 million to $20 million. Pastor Yong Hoon Kim (Open Door Presbyterian Church) (he is serving the church for 21 years) responded to Pastor Park's message. Strong local church raises strong missionary church. God's work comes with God's time. He runs a church with about 3,500 congregation at washington D.C. Each church has its own thumb print. In his church second gens work with the first gens. Jerusalem church opened the door to the Gentiles with different cultures and lifestyles. Thus Antioch church came into being. Jesus broke the cultural and racial barriers, and preached to Samaritans. Likewise, we need to reach out to the second gens. The first gens feel uncomfortable with the second gens and vice versa. Yet for the sake of the gospel, when the first gens open their minds and embrace and empower the second gens, The Lord blesses the ministry, creating synergy effect. This is how his church could grow in number. Morning program began at 8:00 a.m. Dr. Bill Harding served a message entitled, "Mission-oriented church", as presided by Missionary Jacob Lee. As a young boy, Mr. Bill grew up in Ethiopia where his father was a missionary. He based his message on Romans 16:25 (Ephesians 3:20) talking about The Lord God who is able to do more than we can possibly ask or imagine, all thanks to the mystery of God that is revealed to us. God's heart is so big that he has all nations in mind, esp. their salvation, so he sent His one and only Son Jesus, as the Lamb. He was on one Christmas night expecting a truck loaded up with Christmas gifts coming, the gifts that were from his loving family members in the U.S. At the last minute the truck was stuck in a muddy area, so the gifts could not arrive at the door for kids. So the truck driver came up with an alternative, that is, a small lamb, with a red bow tie tied around the neck. He could never forget the scene. God so loved the world that about 2000 years ago, He sent His one and only Son Jesus as the Lamb. Pastor Kyungsik Kim responded to the message, stating the church leadership ought to establish the right motive and attitude towards the church's purpose for world mission, so the motivation should not be to get the church organization grow or to seek some other benefits for the church organization but to obey God's master plan for the salvation of the world as stated in Acts 1:8 and Rev. 7:9. For this plan, first all members of the church ought to have one purpose and one mind, just like the members of the Antioch church. Satan hates to see the gospel spreading to saving souls outside of the church, for Satan keeps tempting the church members to look inside, fighting against each other. World mission ought to be the first priority. The attitude ought to be 'now' not 'later when things are ready'. All church members can start with praying. When we pray God answers and starts working. The leader ought to systematically teach the members for world mission, emphasizing that the church exists for the world mission. As we keep doing this, The Lord starts working. The church leader also ought to establish an organization such as committee. All members ought to either go out or support those who go out. He implemented $1 world mission which began $1 through which his church was able to pioneer 12 local churches. He also established an intercessory prayer group meeting, and a team to do research and make visitations to fields. Pastor Ki-hong Han of Grace Int'l church and Pastor Dong-kap Choi talked about the practical aspects of the world mission work at the local church level. Practically, first start praying. Establish an environment. Preach on the success story. Hold a mission oriented meeting, and encourage leaders to participate in the world mission oriented meetings. Start supporting one missionary. Exchange letters with missionaries. Participate in the short term mission with coworkers. Pastor Dong-gap Choi said we need to have the basic understanding of the local churches, that is, as you go to a field, you go there as a source of blessing (Gen 12:2-3). One missionary went to a mission field. He did not do much except for helping local people to improve their living conditions by laying down new carpet, getting installed a new plumbing system. Then he came back home. The local people missed him, and asked him to come back, which he did, and then he started preaching the gospel, and they accepted Jesus as The Lord. Consider also how The Lord blessed Laban due to Jacob (Gen 30:27) or Potiphar thanks to Joseph (Gen 39:5). KIMNET (Korean Inter-Mission Net Work) hosted a conference with the theme title, "Connecting for Dynamic Mission." About 300 people attended the conference. There are about 45,000 plus churches in S. Korea. In North Amrica alone there are about 4,000 plus "Korean churches" which the Korean churches call 'diaspora' churches. Participants in the conference are missionaries and pastors involved in the diaspora churches. 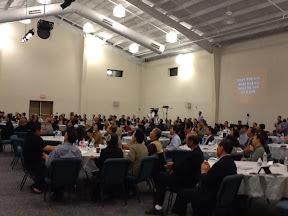 From UBF were in attendance about 30 plus people including Dr. John Jun, Dr. Abraham T. Kim, Missionary Juan Seo of Venezuela, James Lee of S. Africa, and Peter Chang of Germany. From Downey Isaac Kim and Missionary John Kwon attended. The meeting offers the opportunity for the workers to learn from each other. 'all' glory to God the Father. 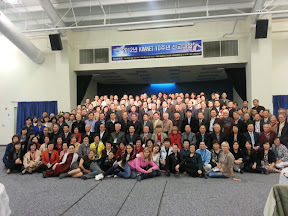 Morning program consisted of sectional meetings on different subjects like: Missionary education; EM mission; leadership development; Net-working in mission field; Mission via media; laymen mission; world campus mission (Abraham T. Kim - UBF); supporting missionaries; intercessory prayer ministry; reaching out the unreached. Praise team led the session. Then Korean traditional song team. Sent by One Light Church of Canada. As of next year it is 7th year that he has been there. 1923 CMA sent two missionaries. Next year is 90th anniversary. 1993 Korean methodist church missionaries went in. 4 directions: - reach out to more people; make them mature as they come in; produce active Christian in the market place; 1975-79 about 2 million died in connection with the killing field, during which about 90% of Christians died, so the nation is lacking leaders. Now they are working to build kindergarten and elementary schools. He is reaching out 1,700 plus children scattered in 7 different areas. They worked with CCC LA team and a team from Toronto. They opened a reach-out meeting where about 80 people responded. So inviting people is easy but raising disciples is hard. Teaching materials are rare, although they are using materials published by Navigator. He is also praying to reach out to school teachers. Mongol, Indo China, Vietnam, and China - 105 degree line. Cambodia is the second China. Suggestions: materials for disciple-making, easy to teach; about 300 Korean missionaries came in, but they do not coordinate. Sponsor church ought to make research in advance, so there would not be conflicts. Many Korean churches got the church buildings built, but they grow empty. Another team consisting of 25 people from another church started the mission journey into the deeper part of Muslim dominant Cambodia. The LORD provided them with interpreters. The Lord performed miracles like opening the eyes of a blind and ears of the deaf. Mission Challenge (Missionary Changho Ahn to Mali). They started out school from kindergarden to middle high school. The area is primarily Muslim area. The Christian schools produce Christians. Every day all school students have to memorize one Bible verse. Now it's been ten years. They graduate from the Christian schools and enter into the Muslim society. Now mostly local leaders are taken over the schools. Now he focuses on 24 African countries are French speaking, primarily located in the W. part of Africa. Mostly Islamic area. Team work is working well. Missionaries also do businesses such as running a Photo shop. Dr. Myers created "yellow window" including 21 of which 6 nations are from the W. Africa. From 2006 they work together like Pastor Huynsoo Lim. Mission Francophone movement is going on. France is also the key city to reach out, for France has the most diverse in terms of ethnic groups. Niger River Project - Mali. God opens the door to Islam. When he prayed one teenage daughter who kept peeing got healed. Late March was coup by Tele-ban, Northern Mali became under the control of Al Queda. This happened after 6 years of ministry. The Lord closed the door. The end of the earth is the place where I am standing as a witness of Jesus. Offering Session with a prayer led by Yong Kyu Choi, the elder of one Chicago based church. Offering song by Pastor Yoochan Choi, serving the First Presbyterian Church of Charlotte. Before the evening sermon based on Daniel 12:3 PRAISE TEAM from Charlotte First Presbyterian offered a special song. 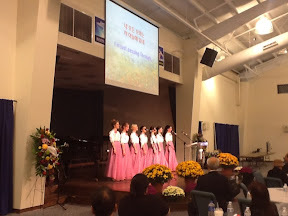 Sung-Kwang Church in Washington DC belonging to the Southern Baptist - Pastor Yong Woo Lim served a special message entitled "Model for the World Mission Oriented Church". 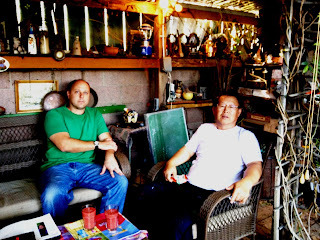 He is from a buddhist family with his wife from a Confucianist's family. His wife came to Jesus first. He started working as a CPA in the U.S. Then after he served a chair person to raise a fund for church building. Sung Kwang means in Korean shining star. This is based on Daniel 12:3. The church started 11 years ago. His wife did not volunteer for the first 7 years. He offered three kids to The Lord. His daughter became a missionary. His second son is an EM minister of his church. The third son Daniel is now in Korea to become a minister for the second gens. In America the homeless save money. He used 60% for world mission. He declared the plan to use 75% for world mission. His church budget is 2.5 mil of which his church uses about 50% for world mission. In his church he does not use the word 'support', but 'co-working'. Training is important. There are no bad dogs; there are only bad dog trainers. They sent out 69 missionaries. They reserve 10%. In this year they have the left over of $250k. Christianity believes in giving. 50 member church sent - 2 missionaries, 100 - 4, 2,000 - 30. After ten years the church was able to send out close to 69 missionaries (60 associate missionaries) to 30 nations. They all got invited to the world mission seminar last year all at their own expenses. Right now the church has 957 members. Oct. 9, 2012 Rebekah and I celebrated our 40th Wedding Anniversary. I almost forgot, but again Rebekah saved me for about 2 weeks before the date, she asked me what I had in mind to do for the 40th. For the occasion we went up from Los Angeles to Monterery. It was her idea. 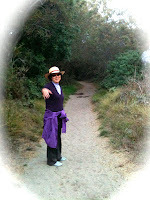 At Monterery bay we visited places like historic monterey, Carmel, Big Sur etc. Since it was a 40th 'celebration', the general mood was supposed to be 'celebratory', but it was not so, for since my wife has a pacemaker she feels/is sort of incapacitated. It's been three months since the surgery, but still she has difficulty to lift anything of weight with her left hand. As my better half has gone weak I myself have been partially disabled. The two nights three days journey involved doing trails. But she grew tired quickly so I could not walk briskly. I took some pictures of her. She took pictures of me also. But I was not enthusiastic about it not only because I am not photogenic, but also because I do not like to see an old man in the picture. Oh, we watched sunsets twice. But I did not like sunsets either, for sunset reminds me of my own sunset. So the mood has been somber from beginning to end. But as I was waiting for the return flight at the Monterey Municipal Airport, I meditated on the words of the Prophet Isaiah and regained a joyous mood. I was reminded that we thought about "us" too much. By God's grace we the Gentiles have been grafted into the natural olive tree and joined the heavenly choir - the people of Zion, the heavenly Jerusalem, singing for joy. Why should we be and indeed are joyful? The reason is not because of us but because of Him. Despite ourselves, we rejoice and sing for joy for we have the great Savior. In what respect is he great? Two things ought to be mentioned: His holiness and his being the Good Shepherd. Holiness has to do with him being set apart or different from all the rest. In what respect is he different? Only in one sense and one sense alone: he alone is self sufficient. His love and power are infinately great. He is independent of all, so all of us who are limited can always depend on Him who in turn can make us sufficient. The American Airline assigned a small airplane (AA #3109) holding about 40 plus people). I was seated at 2A, Rebekah 3C. She already fell asleep. It was a short flight taking about 50 minutes. And I am writing this blog during the flight. And I was no longer sad for what we've become. In fact all of our weaknesses and drawbacks provided me with the reasons to give thanks to Him. After all if we/I had been all strong (and stayed young for good) why would we need a Savior? Sing for joy then for great is the holy one of Israel! P.S. 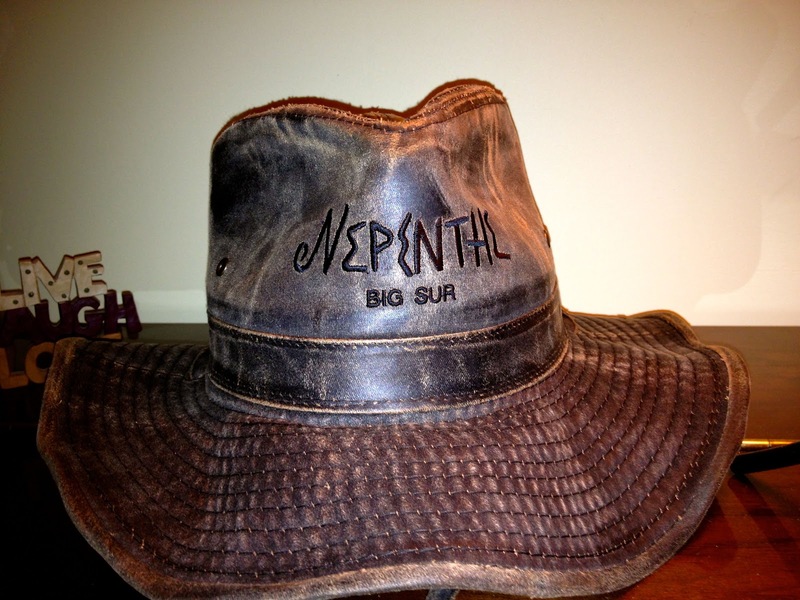 At a store at Big Sur, I bought a hat - the one in the picture. On seeing the hat on display I was curious about the word "Nephethe" so I asked the lady at the counter, "Ma'am, what does Nepenthe mean?" She said, "It means "a drug of forgetfulness. It means 'You can forget your sorrows. It is in a Greek mythology." On Sunday morning while sleeping on the couch at the living room, I had two dreams. There was a sunday worship service. It was a joint worship with two chapters participating - participants from a guest chapter and participants from the host chapter. I was asked to make an announcement, but I did not for I did not wear proper 'costume'. After the worship on my way home, I went up to a mountain and see people returning home: the people from the guest chapter were going back in one single file; whereas a formidable number of people from the host chapter coming out of the center in droves, covering the whole mountain. I was brought back in time to the days of Moses in Egypt when Moses was still in power (a chief prince under Pharaoh). I saw the irrigation system, the way farm lands were organized, and the way they produce and get the crops transported. Particularly the transportation system looked impressive. Like a vast army marching in a single column, animals carrying mountainous loads of wheat all neatly packed on their backs moved without making a noise. At the end of the column I saw a man of gigantic size whose back is as broad as 4 by 8 feet carrying the crops. I saw officials from foreign nations coming in and out of the administration office building through a gigantic door, asking the local officers (who seemed to be the managers of the farm lands in charge of food production). The visitors from other nations were holding a writing pad, putting down the information the managers freely shared. No. 1 - environment does not matter; the God factor does, for fruit-bearing. In the day of Joseph the Egyptians had seven years of thickness, which were followed by seven thin years. What makes the land thin or thick? Is it the seven Niles? Or something else? No. 2 - a mother like shepherd: we are studying the first samuel. As the Lord blessed Hannah to help Samuel learn at the Lord's feet, hope grew in an otherwise hopeless generation, the hope to build the orderly kingdom of God. Do we have prayerful mothers or mother like shepherds praying for their sons and daughters (flock of God)? Or do we drive them out of the ministry to somewhere else? A mother like shepherd gathers young ones to grow under the Lord's leadership, but a politically minded legalistic leadership drives them out to somewhere else. When things go wrong, fallen men tend to find someone to blame. When Eve sinned she said in effect the devil made me to it. It was Adam who ate the forbidden fruit, but he also said in effect, "She made me do it." As long as you can find someone to blame for an unlucky situation arriving at your door, you do not have to do a thing, for you are not responsible for the consequence(s) of your own action. But the problem here is that since you are the origin of the problem unless and until you change, the problem will not disappear. It will only go from bad to worse. In the day of Isaiah, people of the Southern Kingdom (Judah) heard the news that two northern kingdoms (Syria and Damascus) banded together to invade Judah. They called the pact a 'conspiracy'. But the Lord said to Isaiah, "Do not call conspiracy everything people call conspiracy." Why? We find the answer to the question in what the Lord said: you are not supposed to call it conspiracy for it is NOT a conspiracy. By definition, conspiracy is an evil, unlawful, treacherous, or surreptitious plan formulated in secret by two or more persons. They were supposed to put trust in the Lord and live in peace. But they rejected the Lord and rejoiced over the visible people. Thus the problem grew worse: the Tsunami originated from Assyria (present day Iraq/Iran) hit the Southern Kingdom. So do not exchange the Lord for someone or something else (such as ministry). In Isaiah 6, Isaiah heard seraphs calling to one another, "Holy, holy, holy is the Lord Almighty; the whole earth is full of his glory." What the seraphs say is surprising, for the memory of my recent visit to African nations especially Nigeria is still fresh. While walking on the streets of Lagos can you honestly say, "The whole earth is full of his glory?" One day prior to the conference began, we moved from the airport to a Redemption Camp Conference site. As we moved on the road by a van while seated in the most back seat of the van, I saw from the left side of the window a middle aged woman lying dead in a pool of blood, next to a center divider; her body was separated - head severed from the torso. One missionary to Unilag, Lagos was upset for when he first arrived, he saw the same thing: a body lying dead in front of his work, Samsung Electronics, 'all day long'. Recently Yabatech UBF Bible house got robbed; a band of robbers came, and took away virtually 'everything' - computers, musical instruments, etc. The Unilag Bible house is still leaking. It costs $7,500 to re-do the roof. Requests for assistance (monetary donations) were made to several coworkers, but no one seemed 'interested'. On a personal level, during a night drive from Baltimore Washington Airport to the College Park of Maryland, I was lost in the middle, so I got soaked in the night rain. Soon I got a cold, and I am still struggling to recover. I prayed and I rested. I took Tylenol. Fever dropped but still virus does not go away. And I admit that my body came from the earth. Holy, holy, holy, is the Lord Almighty: the whole earth is full of his glory. How so? Why is the seraph's experience at variance with facts we the 'humans' observe? Seraphs are spiritual beings. They do not have a physical body like the one we have. [They have faces, feet, and wings, and they are able to make sound, but this does not mean that their body is made of earthly components such as iron, water, etc.] According to Jewish resources, their mission is to 'protect' (whatever that means) God's holiness. Obviously they have never fallen. Arguably they are aware of the 'fallen' condition of men on earth; they appear in the know about the nature being under God's curse, for in order for you to protect good from bad you are supposed to know what is bad. Yet, they maintain, "the whole earth is full of his glory." Why? I think the answer is that the eyes are different. 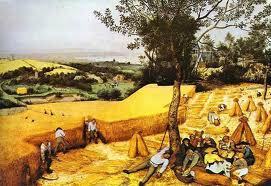 Consider what produces the disparity (the disparity between man's perception and seraphs' perception of the earthly condition), that is, the seraphs see what it is supposed (and is going) to be, whereas we see the snap-shot and therefore the still-shot of the reality we are in. God exists beyond the time domain. To him past, present, and future are all seen. In him, the ideal state (the earth which is full of his glory in an un-fallen state) exists fully, and the potential and the possibility for the ideals to become reality remain in Him in an unbridged form all the time and beyond the time. While in a body we experience his glory partially, and for those who believe in Jesus Christ, the conditions are set in such a way that the full glory is to be revealed at the time of Christ's return. Romans 8:18; 1Peter 1:7; 4:13; 5:1.